Blocked drains, sewers and toilets can cause major damage if they’re left unattended but luckily there are fast and effective solutions. At Plumbing Central we provide 24/7 emergency drainage services within 30k of Roselands, Sydney. Call 0410 011 999 immediately if you need help now. If you have blocked drains or your home exhibits signs of a blockage, call us on 0410 011 999 now. If your plumbing has these common problems, contact us and we can locate the exact nature and location of your blockage. When we arrive at your location, we will use the latest technologies and procedures to locate your blockage. We have CCTV sewer cameras with location equipment for pipes from 100mm to 600mm. This is an effective and affordable way to locate your blockage, allowing us to take action faster. After we have inspected your pipes we can provide a detailed report on all our findings. If permanent damage has been done to your sewers, we can provide extensive repair options. Sometimes your pipes won’t need repairs, just cleaning. We will use our superior high pressure drain cleaning equipment – called jet blasters – to clear your pipes. Our high pressure jet blasters are designed to be used in confined environments and provide a complete clean. 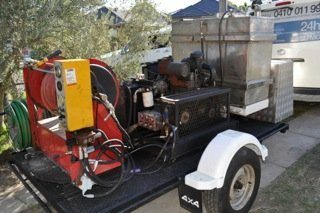 Jet blasting uses very high pressure water and is highly effective at clearing all kinds of drains including pipes, sewers, grease traps and blocked drains due to overgrown tree roots. For 24 hour emergency relief, contact the drainage experts today. Call us on 0410 011 999 to save time and money.